Originally, we planned on having a cookout at our neighbors house. Charlene and Bob. Over the past few years, they've become family. Dinner plans...nothing fancy. Kabobs. Pasta salad. Drinks. Roughly around 5 p.m. They were running late. So were we. Earlier in the afternoon, we learned of hot air balloon rides down the road followed by fireworks. 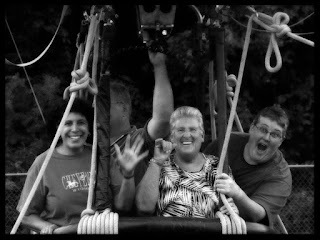 Our other neighbor, June, who is family to us as well, mentioned the hot air balloon ride. Were we going? Nope. I'm afraid of heights. Lisa and I can take or leave fireworks. As the afternoon went on, I couldn't get the look on June's face out of my head. Her eyes lit up. 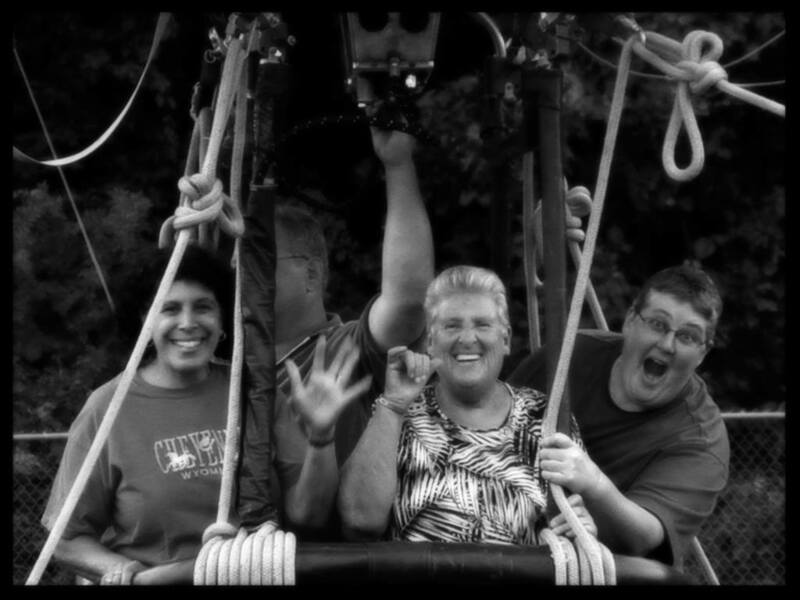 At the age of 69, she had never been in a hot air balloon. Who was I to let my petty fear of heights interfere with the possibility of her experiencing a ride in a hot air balloon. I discussed my thoughts with Lisa. "Let's go. I'm sure Charlene and Bob won't mind heading out after dinner with us. It'll be fun." That's exactly what happened. I let June know we were going. Her face lit up. We set a time to pick her up. After we ate, Charlene presented Lisa with a surprise birthday cake. We had time for a few games of horseshoes and then, it was time to go. I had a few "adult beverages" with dinner. My confidence was overflowing. Bubbly. I would get in the hot air balloon. The balloon is tied down. No free flying. You go up. You come down. Five minutes tops. Long story short, an hour later, while standing in line, my confidence ran several laps around the track and bolted. I asked Lisa if she had ever been up in a hot air balloon. "Good. Here's $10. Happy Birthday. I love you. Have fun." We assisted June into the hot air balloon. Lisa and Char got in. I stayed on the ground and took photos. Everyone was happy. Later, the 5 of us sat on the bleachers at the football field. It had been decades since I had stepped foot on a high school football field. It felt nostalgic. We watched the fireworks from the distance. We arrived home around 10 p.m. The kids were sleeping until they heard the key in the door. Bark. Bark. Bark. Bark. Tails wagging. More barking. I got on the floor. Poor Lobo was beside himself. It was the first time we had ever left him home alone during the evening hours. After a few biscuits, we were forgiven for our absence.